Wye Valley lies in the community of Llangurig in the county of Powys. It is located at Ordnance Survey national grid reference SN82658510. 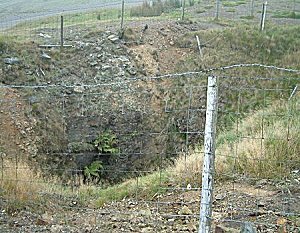 The mine is recorded in the CPAT Historic Environment Record as number 18979 and this number should be quoted in all correspondence. The workings are on a branch vein of the main NE-SW lode in Nant Y Gwrdy. Exposure of the vein here displays a quartz brecciated gangue in rocks of the Silurian Frongoch formation. Four shafts (SN83158506, SN82988501, SN82868499) and an adit (SN82818505). The earlier engine shaft is drained by an adit crosscut with extensive stoping above adit. A second shaft was sunk in 1879. A reservoir on Nant Y Gwrdy at SN83138521 drove the dressing floors to the west. In 1874/5 a self acting dressing plant was installed on the dressing floors SN82698510 but this is now almost totally destroyed by clearance for farm buildings and parking areas.